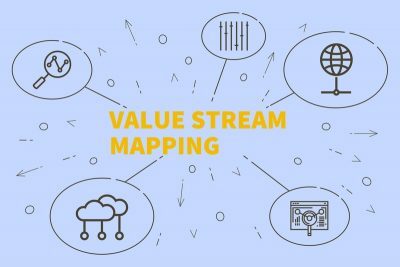 So how do you create a Value Stream Map (VSM)? The first step is to identify exactly what value is from the point of view of the customer. In other words, it’s the customer who specifies what they deem as being value in your product or service. Do a walkthrough of the entire process of what it takes to produce the product or service. This has to be done after you have identified what exactly the customer deems as value. In the walkthrough, make sure you distinguish between which steps add value and which are waste. Make a Value Stream Map (VSM) of the current state of the process. Gather data such as time, quality, or any other resources available for each step. Decide the opportunities for improvements. Identify bottlenecks and any other obstacles that might restrict flow. Find ways to eliminate waste and add value to the current process. Create a prospective future state map to illustrate the goals desired. This future map should make visualizing easy to gain a better perspective. Design plans to put future state into action. Remember, a value stream map should represent or show the entire flow of the process from supplier through to customer, so start to finish. This also should show the flow of all data concerning the VSM. After you are finished creating this VSM, you should be able to pinpoint where the delays take place, or if there are any excesses inventory or obstacles. A value stream map is one of the most important tools lean provides. Having a VSM will keep you ahead because you will always know exactly what is currently going in the manufacturing process of your business. Knowing what adds value and eliminating waste will keep your business fine tuned! For more information on our Lean Six Sigma courses or services, please visit our website.